As an intro to a unit covering the Romantics or Transcendentalism, students will write their own Romantic Ode. By following a poem frame, students will bring the outdoors inside, and discover how the Romantics glorified nature. Students will work in pairs and use melodramatic language, and thus have fun with the actual writing and sharing of the poem. 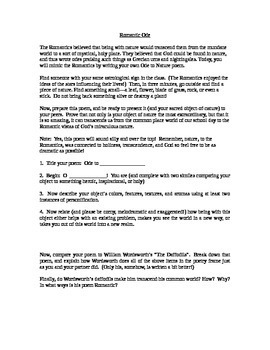 Then, by comparing their own writing with a poem from William Wordsworth, students will discover the nuances of Romantic or Transcendental thought.